Two residents of a home gutted by fire early today were critically injured, officials said. A third resident also was taken to the hospital following the 5:30 a.m. blaze at 928 S. State St., said Ann Arbor Police Chief Barnett Jones, the safety services administrator. 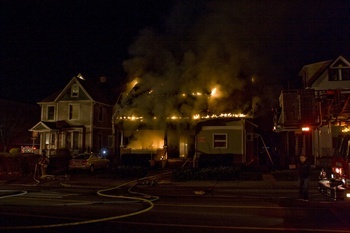 At least three people were injured in the fire. Jones, who was on the scene this morning, said he did not have updated information on the conditions of the residents and did not know how many people were inside the home when the fire broke out. Officials said the fire was initially reported as a bag on fire on the porch. When firefighters arrived, a man and woman ran from the home on fire, and firefighters immediately began rendering aid, Jones said. One of the injured occupants is a University of Michigan student, officials said. Two people were rescued from the back of the house, two other people came out and one person jumped, fire officials said earlier. The cause has not been determined. Two other fires involving cars and trash cans also were reported overnight, including one that consumed three cars on Church Street, officials said. South State Street was closed following the fire. As of 10:15 a.m., the northbound lanes were reopened, and one lane southbound remained blocked.